Highlights of Josefowicz’s 2018/19 season include concerts with the New York Philharmonic, The Cleveland Orchestra, Hong Kong Philharmonic, WDR Sinfonieorchester, Tonhalle-Orchester Zürich, Oslo Philharmonic Orchestra, Houston and St. Louis symphonys, and the Toronto and Baltimore symphony orchestras, working with conductors at the highest level including Jaap van Zweden, Christoph Eschenbach and Matthias Pintscher. A favourite of many living composers, Josefowicz enjoyed a close working relationship with the late Oliver Knussen performing together over 30 times, most of these with his violin concerto. Josefowicz has premiered many new concertos with composers including John Adams, Esa-Pekka Salonen, Colin Matthews and Steven Mackey, all writing especially for her. 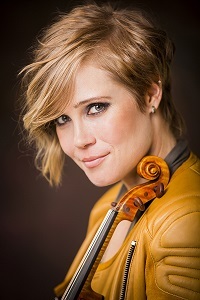 Josefowicz gave the world premiere of Adams’ Scheherazade.2 (Dramatic Symphony for Violin and Orchestra) in 2015 with the New York Philharmonic and Alan Gilbert. Luca Francesconi’s concerto Duende – The Dark Notes, was given its world premiere by Josefowicz (also written for her) in 2014 with Swedish Radio Symphony Orchestra and Susanna Mälkki, and subsequently performed again with BBC Symphony Orchestra and Mälkki at the BBC Proms in 2015.